Tom Kowalski, President and CEO of Urban Transportation Associates, Inc. (UTA) has donated two Automatic Passenger Counters (APCs) to the Lehman Center for Transportation Research (LCTR). APCs are devices that automatically count the number of passengers as they board and alight buses at each stop during a trip. An on-board microcomputer is the central processing unit of an APC system. It analyzes the signals received from the sensors in real time, then creates an electronic record at each bus stop and stores the results in memory. Data stored typically include the following elements: vehicle location, date and time the bus stops, time the doors open and close, number of passengers boarding, and number of passengers alighting. 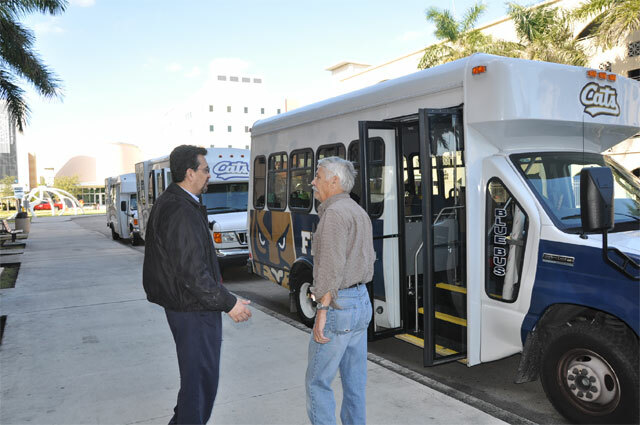 With the assistance of the FIU Department of Parking and Transportation, the two APCs have been installed in two of the FIU CATS Shuttle buses. Dr. Fabian Cevallos, Transit Program Director with LCTR, envisions that data collected from this system will be used to monitor and improve the FIU’s CATS service, and by students and researchers, and will help enhance the LCTR’s Advanced Public Transportation Systems (APTS) program.